Battle of Rush Creek (February 8-9, 1865) – Following the Battle of Mud Springs, the large group of Sioux, Cheyenne, and Arapaho, numbering as many as 5,000 moved leisurely to the North Platte River on February 6, 1865. They crossed the frozen river and camped among the bluffs about five miles north of the river. Joined by the warriors returning from the battle, the Indians planned to remain there for several days to rest their horses, not anticipating that the outnumbered soldiers would follow them. Lieutenant Colonel William O. Collins, however, left a small garrison of soldiers at Mud Springs and, along with 140-185 troops and soon picked up the Indian trail. They first came upon their previous camp which was littered with spoils of their plunder and from there, followed their trail to the North Platte River. Coming close to the Indian camp in the early afternoon of February 8th, a Sioux warrior signaled the other warriors that the soldiers were approaching. Within no time, some 1,000 warriors mounted their horses and crossed the flat Platte Valley to engage the soldiers. Seeing the Indians approach, Collins formed a “corral” with wagon and horses and ordered his men to dig pits and establish defense lines among the sandy ridges on the plain. As the warriors approached, along-distance shooting match ensued and shots from a howitzer kept the Indians at a distance. As some of the Indians crept closer, Collins ordered a detail of 17 men to charge and disperse them, which was successful, though two of the men were killed. The Indians withdrew in the late afternoon and Collins remained in his defensive position overnight. 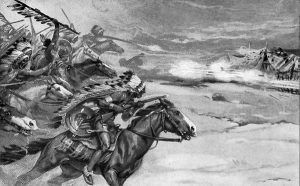 The next morning several hundred Indian warriors returned to resume the attack on Collins and attempted to capture the horses. After long-distance sniping for several hours, the warriors broke off the battle. The Indians broke camp the same day and began moving northward while the warriors were keeping the soldiers pinned down. The Indians crossed the Sand Hills in two long days and westward toward the Powder River. Collins did not continue the pursuit of the Indians, and on February 10, began the journey back to Fort Laramie. Collins reported two men killed and nine wounded with another 10 men suffering frostbite. He estimated the Indian casualties at Mud Springs and Rush Creek at 100 to 150. However, Cheyenne warrior, George Bent, would later say that only two Indians were wounded, and one killed. The inconclusive battle took place four miles southeast of present-day Broadwater, Nebraska along both banks of the North Platte River.